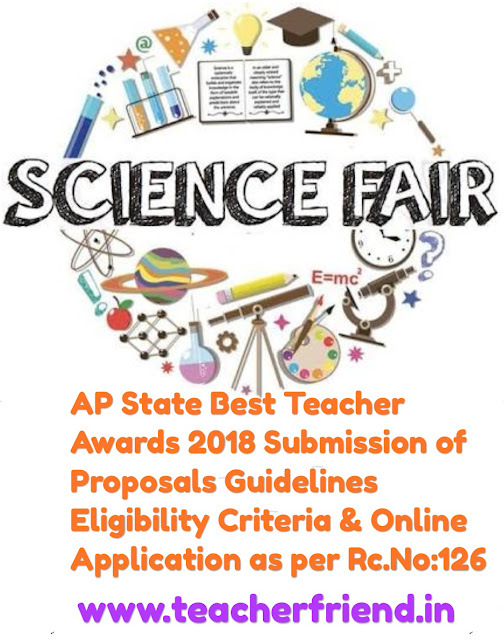 AP State Best Teacher Awards 2018 - Submission of Proposals - Guidelines, Criteria, Online Application / State Awards to the Teachers for the Academic year 2018 -2019 Submission of Proposals by the District Selection Committee as per Rc.No.126 dated.17.07.2018. All the District Educational Officers in the state are informed that the STATE AWARDS, 2018 to the Best Teachers of Andhra Pradesh are being given every year on the Teachers' day i.e., 5th September. I am to further inform that Awards are proposed to be given to the deserving teachers & Teacher Educators working under the categories at a State Function will be held on 5th September, 2018. The Academic Standards of his Students. Any other District Level Officer (Nominated by District Collector). Representative of Good Voluntary Organization interested in Education. Get Download Teachers Category wise Alloted Points Table Click Here. Get Download Online Application Click Here.